Quick – 5 seconds – what do you think of when you think of healthy snacks? Lemme guess… fruit and yogurt; vegetables and hummus; pretzels; granola bars… Probably not pistachios though, right? Well… Here’s some good news for all you nut lovers who also want to make this year your healthiest one yet. 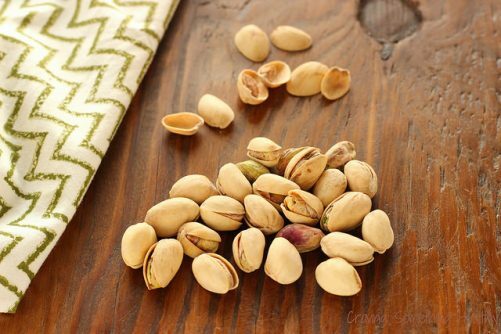 You are SO allowed to add pistachios, especially the ones in the shell, to your list of healthy snacks. Hooray! Happy dance! If you’ve always thought of delicious pistachios in the shell in the same category of diet busting potato chips and soda, think again. They’re one of my all-time favorites to recommend as a great source of healthy fats and protein, and they make a perfect addition to a healthy snack plate. Notice that I said “snack plate” That’s because I ALWAYS tell my clients (and readers) to choose at least 3 foods every time you eat – and that includes snacks. A fruit and/or a vegetable, a protein, and some healthy fat = a healthy, balanced snack. Pistachios are a great source of unsaturated, heart healthy fat, as well as fiber and healthy vitamins and minerals. Sorry, chips and soda, game over for you. You might have heard pistachios in the shell called the Skinny Nut, and there’s good reason for that. They’re one of the lowest calorie nuts. A one-ounce serving has only about 160 calories, and you know those shells? They’re a perfect way to practice mindful eating, because they naturally force you to slow down to open each one, and the empty shells remind you of what you’ve already eaten. All in all, pistachios are like a secret weapon to help you get back on track in 2015. 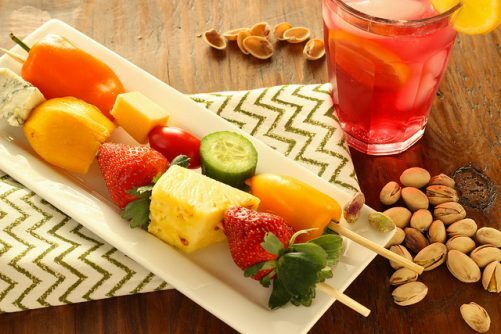 I love to add in-shell pistachios to this healthy snack pairing of fruit, vegetable and cheese skewers that’s served along with a pitcher of iced pomegranate green tea. The beautiful colors, textures, and flavors of this pairing feeds the senses, taste buds, and the body. 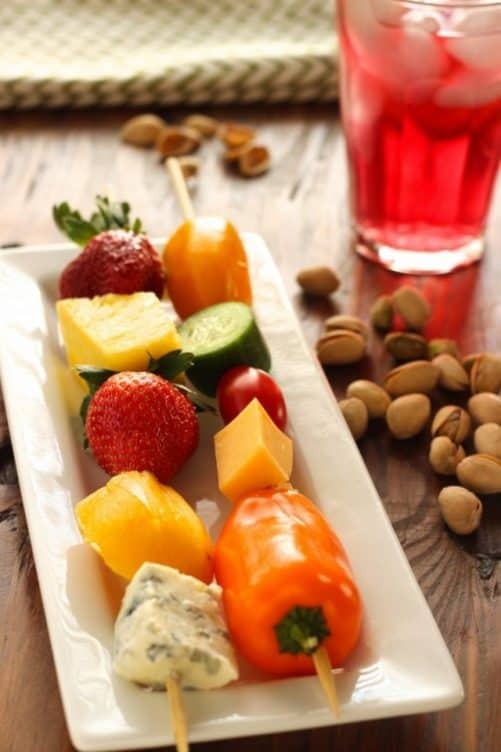 I used colorful grape tomatoes, mini sweet peppers and sliced seedless cucumbers with smoked Gouda cheese for my veggie skewers, and fresh strawberry, mango and pineapple chunks with Gorgonzola Dolce for my fruit skewers. 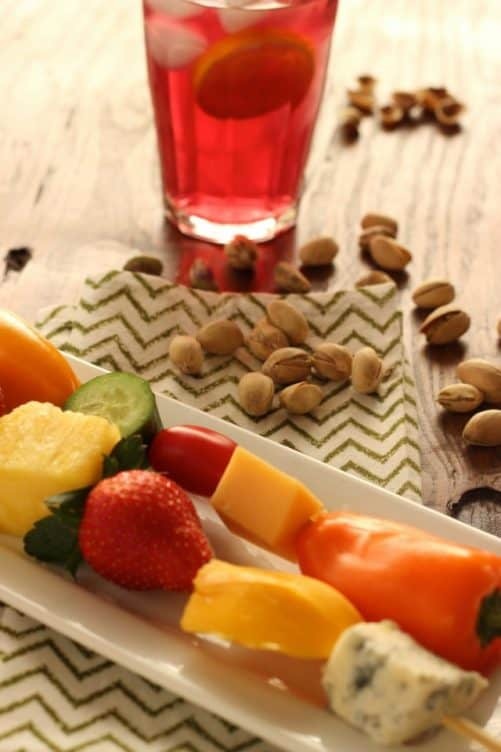 The pistachios add the salty crunch, and pomegranate sun tea is a refreshing and healthy drink that tops off this pairing perfectly. Hey – wanna win a YEAR’S SUPPLY of PISTACHIOS so you can snack healthy all year long?! Just enter the Year of the Skinny Nut Sweepstakes hosted on the Pistachio Health Institute Facebook page. Love this snack idea! As I get more into my whole30, snacking on nuts is becoming a habit and pistachios are Whole30 Compliant! I find it only takes a small handful to satisfy my hunger and added with the fruit it will get me through my afternoon slump!